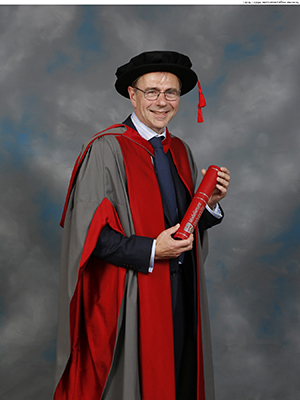 Professor Sir David Fish, Managing Director of UCLPartners and neuroscience specialist, has been awarded an honorary degree by Middlesex University. UCLPartners is an academic health science partnership, made up of 11 higher education institutions (including Middlesex University) and 23 NHS organisations. As a partnership, it helps to improve healthcare and economic gain for over six million people through a range of activities including, speeding the translation of cutting-edge research and innovation into measureable improvements in the NHS and developing high quality training and education for health professionals. Within the field of neuroscience, Professor Fish focused particularly on epilepsy. He has worked as a consultant in Neurology and Clinical Neurophysiology, and was Medical Director of the Specialist Hospitals Board at University College London Hospitals NHS Foundation Trust. He has also written and contributed to over 150 publications on neuroscience, and is currently a member of the London Health Commission Board. In the most recent Queen's Birthday Honours List, Professor Fish was awarded a knighthood in recognition of his role at UCLPartners and services to the NHS. Talking about his Middlesex University honorary degree, Professor Fish said: "It is a great honour to be given this award. I know that training excellence and partnership values are embedded in the culture at Middlesex; I see this in the staff members I meet across the partnership who have trained there." Middlesex University Vice-Chancellor Professor Michael Driscoll said: "Professor Sir David Fish has been hugely influential in improving healthcare for people throughout Britain. "Middlesex University is very proud of its involvement in UCLPartners, and I'm so pleased to be able to give Professor Fish this award."